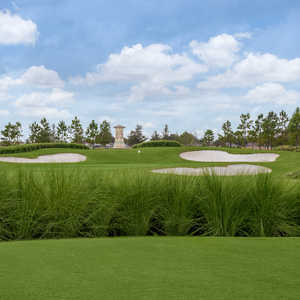 KISSIMMEE, Fla. -- When ChampionsGate opened in 2000 it was one of Orlando's most anticipated golf arrivals in years. Thirty-six holes, a commercial development, a planned Omni Hotel (set to open fall 2004), and the presence of architect Greg Norman will tend to generate enthusiasm. Located just 10 minutes south of Disney World Resorts off I-4, the complex would also trail blaze new territory on the city's southwestern frontier. ChampionsGate indeed opened to a generally enthusiastic response; it was a tremendous facility and an original look for Orlando. The praise, however, fell vaguely short of expected adulation, particularly in regards to the ambitious International Course, a rough and tumbling layout designed to emulate the playing characteristics of golf in the British Isles (the National Course, conversely, represents American golf motifs). Perhaps it was simply misunderstood, but more than a few players walked away either beat up or feeling it didn't quite hit the mark. Whether that mark was set too high, and by whom, is a matter for debate, but for many ChampionsGate was better in the imagination. Ironically, criticism that the rough areas off the fairways were either unforgiving or primitive may speak to the design's success; perhaps the International Course was too much like its fast and firm links models. It begged the question: did those lobbing these critiques have first hand experience on international golf courses? It's probably fair to say that much of the initial excitement surrounding ChampionsGate stemmed from Norman's involvement. Since 2000, Greg Norman Golf Course Design has nearly doubled its previous output in Florida, but at the time the firm's appearance in Central Florida was big news. Norman's southeastern designs seem to abide to unique design ideals, evidenced in his Florida courses. 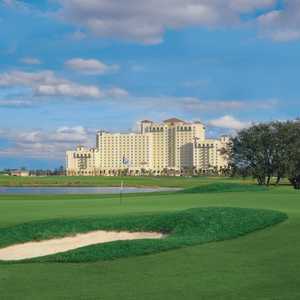 These include: a general disdain for formalized rough (examples are The Medalist in Hobe Sound, Tiburon in Naples, and the new Grande Lakes at the Orlando Ritz-Carlton, opened in 2003); crowned greens and scalped green surrounds that encourage short game multiplicity (Shark's Tooth near Panama City, Medalist, Grande Lakes); the use of crushed coquina shell waste areas to provide visual color contrasts, transitions to native areas, and cart path usage (Tiburon, The Great White Course at Doral); and the utilization of atypical forms of bunkering, such as stacked sod wall (Tiburon, Shark's Tooth, Medalist) or small scab bunkers. Norman also eschews tilling large quantities of land, preferring to let the natural surface dictate slope and character even when it's lacks primary movement. ChampionsGate International Course, by contrast, remains defiant of many of these recurring features. While most of the green complexes do consist of wide aprons mown at fairway height Norman moved significant amounts of earth to create barriers and ridges that run parallel to the fairway lines, so many holes, particularly on the first nine, play below dune level not unlike Royal Birkdale. These high-side dunes were then cut with numerous, randomly placed pot bunkers and planted with swirling grasses that grow down literally into the banks of the hazards and to just paces off the fairway. Holes seven and eight (an optically intimidating par-4 and a potentially reachable par-5 respectively) offer the best expressions of this "landscaping." Shots missed slightly can yield unplayable lies and even lost balls. Welcome to British golf. What's interesting about the "creation" of the British-style course, particularly the uncharacteristic movement of dirt, is that the site is arguably one of the most naturally interesting the Norman group has had to work with in Florida. Not that it's a great property by golf standards, but, let's face it, Norman has had some real stinkers for properties. The land outside these manufactured holes, particularly that encompassing holes 13 through 18, shows at least minor topographical motion. It's slightly puzzling Norman's team chose to dress it up to such an extent, but apparently they didn't think their usual application would adequately replicate what American's expect links golf to look like. However impressive the presentation individually, the scraggly dunes at times seems out of place, particularly when buffeted by water hazards (seven, eight, sixteen). Norman's green complexes here are typically excellent. Green sizes and shapes vary greatly and most golfers will continually find themselves off the putting surface wondering how to navigate the bumps and slopes to get the ball back on. Consequences for missing the fairways are dire but there's room to drive the ball. Players able to shape shots will be rewarded, but shaping is not a priority - club selection is. The demanding approaches force the player to constantly think, where the best miss? The International Course begins to fully express itself at the outstanding par-5 third that calls for a diagonal drive across a wetland area (pick your line carefully), followed by two position shots between the hazard-laced dunes. The fourth would be a potentially drivable par-4 (284-369 yards) were the area short of the green not so constricted by bunkers and a waste area; most players will not even try to get home (unless they can fly it virtually all the way on), which hinders the hole's full potential. Twelve, another drivable par-4 (280-344 yards) with a lovely and modest green complex and two spaced fairway oaks to negotiate, commences a string of four powerful holes. After a long and broad four-par at 13 comes one of the most difficult par-3's in the region. Downhill but tipping out at over 230 yards, the shallow but green raised at the middle befuddles with slope and a solo pot bunker annoyingly placed front and center. Fifteen might be the strongest hole on the course, a 455-yard par-4 with two fairway bunkers to chew on and a lateral hazard along the left. The approach must carry the hazard's inlet short and left of a shallow, raised green that falls away on all sides. Seventeen is a picturesque one shot hole with the green nestled down in the dunes. Regardless of the slight wariness -- or perhaps a better word for it is reluctance -- initially expressed by some, the International Course has duly become entrenched among the first rank of Central Florida courses, if not quite out in front of the pack as some might have predicted. This is a golf course that's thoughtful and engaging "between the lines," but often it's the lines that garner the attention. Certainly the rough areas were created to make an impression, but it remains notable that Norman 's southeastern designs usually succeed by avoiding such flamboyance and sticking to what's native. Norman should be given credit for his design principles - they are a welcome diversion from the standardized framing and handholding school of architecture that dominates the industry. His designs encourage the player to think and experiment. However, at times the firm's minimalist style is under-whelming, namely when there's no movement in the ground, which, unfortunately, is common in most of their Florida sites. ChampionsGate was one property with some actual intrigue to the property (by statewide standards), yet this was the site that got hammed up. Go figure.